After breakfast at 0730, with your lunch packed, start drive to Tarangire National Park for game drive - a game park with thousands of majestic baobab trees dotting the rolling countryside. It is also home to enormous herds of elephants and the highest number of recorded bird species for any habitat in the world. The Tarangire River runs through the land, providing a permanent water source, and along with it the promise of strong wildlife. Later in the evening start drive to Country Lodge/Maramboi Tented Camp for dinner and overnight. Meal plan full board. In the evening start drive out to Rhino Lodge or Ongata Tented Camp for Dinner & Overnight. Meal Plan full board. After your early breakfast at 0700 with your packed lunch depart to Serengeti while enjoying game enroute. 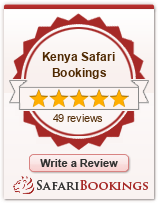 Dinner & Overnight stay at Serengeti Katikati Tented Camp or Tortilss Camps. Meal plan full board. Breakfast is followed by a full day game drive in Serengeti National Park while accompanied with your lunch boxex. This Park cover an area of 14,763sq km, the name Serengeti come from Maasai language and means “endless plains”. Here you will also see wildlife like lions, thompsons and grant gazelles, zebras, buffalos, hippos, elephants, cheetahs and rhinos. Later drive back to Serengeti KatiKati Tented Camp or Tortilss Camps. for Dinner & overnight. Meal plan full board. After breakfast enjoy morning game drive and later drive to Isbania for drop off. After having completed the entry regulations you drive on partly bad routes to Masai Mara. What seems to be only a short distance on the map can take a couple of hours. But the drive is absolutely worth it, as the Mara is known as the reserve with the highest lion density in Africa. You stay overnight at the Mara West Camp outside the reserve and enjoy a wonderful view over the wideness of Masai Mara. The next two days enable you to discover the Masai Mara during long game drives. Amongst others you will visit the Mara River which is one of the biggest barriers for the animals during their annual migration. It's nearly impossible to imagine how thousands of zebras and gnus try to reach the opposite shores of the rivers, while crocodiles are already waiting for their meal. But also during other seasons you will see hippos, crocodiles and other animals here. Dinner and overnight at Mara Sidai Camp outside the game reserve. Pre-breakfast game drive. After breakfast, proceed to Lake Nakuru, which is often referred to as the pink lake for it’s great masses of pink flamingos and the home of the white and black rhinos and about 350 different species of birds; the Ornithological Paradise. Arrive in time for lunch then go for afternoon game drive.